This entry was posted in frog, frogs, Northern Water Snake, pond, snake and tagged Fish, Frog, Northern Water Snake by Annie. Bookmark the permalink. Except for the close encounter in the thicket, we watch each other from across the pond. Your blog made me want to make a delicious drink and go watch the sunset over our river. Great photography! And I love Michigan! OMG! I’d be afraid to go out to the pond! Can you hire somebody to catch it for you? I’m hiring myself to catch this intruder. Stay tuned! What a bummer! 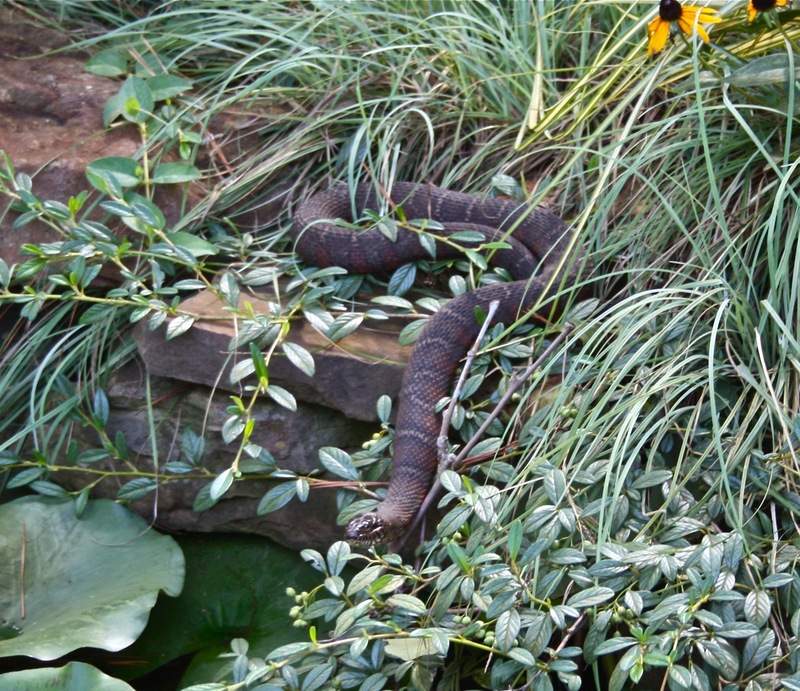 Awesome to see this slithering beast but not awesome that he’s eating your pond space out of house and home. I’m sad for your frogs. Love your blog. Checked out your walking stick. Our walking stick in Virginia is thinner and really resembles a twig. Thank goodness it doesn’t emit a fluid either! Sounds like you are gearing up for battle. You might try a minnow net although I’m not sure it is deep enough for this chubby snake. Even if he escapes your capture, the attempt itself might be enough to make him re-locate. Good luck! Keep us posted. I don’t plan to lose my balance and fall in the pond like I did last summer to scare a snake. It worked to scare a garter snake but not so sure about this fella. I could never hurt a snake. But I could use your help in catching him! Very greedy snake. Bad snake has to go away. Poor froggies in the lagoon he will soon inhabit. Don’t make me think about that! We need an update! Any luck getting rid of him?